Identify the demanders and suppliers in a financial market. Explain the role of price ceilings and usury laws in the U.S.
United States’ households, institutions, and domestic businesses saved almost $1.9 trillion in 2013. Where did that savings go and what was it used for? Some of the savings ended up in banks, which in turn loaned the money to individuals or businesses that wanted to borrow money. Some was invested in private companies or loaned to government agencies that wanted to borrow money to raise funds for purposes like building roads or mass transit. Some firms reinvested their savings in their own businesses. Let’s consider the market for borrowing money with credit cards. In 2014, almost 200 million Americans were cardholders. Credit cards allow you to borrow money from the card’s issuer, and pay back the borrowed amount plus interest, though most allow you a period of time in which you can repay the loan without paying interest. A typical credit card interest rate ranges from 12% to 18% per year. In 2014, Americans had about $793 billion outstanding in credit card debts. About half of U.S. families with credit cards report that they almost always pay the full balance on time, but one-quarter of U.S. families with credit cards say that they “hardly ever” pay off the card in full. In fact, in 2014, 56% of consumers carried an unpaid balance in the last 12 months. Let’s say that, on average, the annual interest rate for credit card borrowing is 15% per year. So, Americans pay tens of billions of dollars every year in interest on their credit cards—plus basic fees for the credit card or fees for late payments. Figure 1 illustrates demand and supply in the financial market for credit cards. The horizontal axis of the financial market shows the quantity of money that is loaned or borrowed in this market. The vertical or price axis shows the rate of return, which in the case of credit card borrowing can be measured with an interest rate. Table 5 shows the quantity of financial capital that consumers demand at various interest rates and the quantity that credit card firms (often banks) are willing to supply. Figure 1. Demand and Supply for Borrowing Money with Credit Cards. 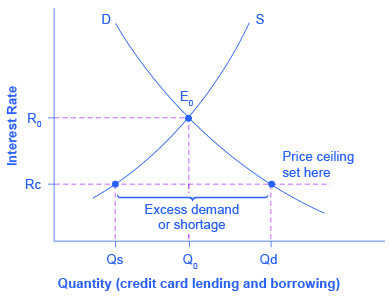 In this market for credit card borrowing, the demand curve (D) for borrowing financial capital intersects the supply curve (S) for lending financial capital at equilibrium €. At the equilibrium, the interest rate (the “price” in this market) is 15% and the quantity of financial capital being loaned and borrowed is $600 billion. The equilibrium price is where the quantity demanded and the quantity supplied are equal. At an above-equilibrium interest rate like 21%, the quantity of financial capital supplied would increase to $750 billion, but the quantity demanded would decrease to $480 billion. At a below-equilibrium interest rate like 13%, the quantity of financial capital demanded would increase to $700 billion, but the quantity of financial capital supplied would decrease to $510 billion. Figure 2. The United States as a Global Borrower Before U.S. Debt Uncertainty. The graph shows the demand for financial capital from and supply of financial capital into the U.S. financial markets by the foreign sector before the increase in uncertainty regarding U.S. public debt. The original equilibrium (E0) occurs at an equilibrium rate of return (R0) and the equilibrium quantity is at Q0. Figure 3. The United States as a Global Borrower Before and After U.S. Debt Uncertainty. The graph shows the demand for financial capital and supply of financial capital into the U.S. financial markets by the foreign sector before and after the increase in uncertainty regarding U.S. public debt. The original equilibrium (E0) occurs at an equilibrium rate of return (R0) and the equilibrium quantity is at Q0. Figure 4. Credit Card Interest Rates: Another Price Ceiling Example. The original intersection of demand D and supply S occurs at equilibrium E0. However, a price ceiling is set at the interest rate Rc, below the equilibrium interest rate R0, and so the interest rate cannot adjust upward to the equilibrium. At the price ceiling, the quantity demanded, Qd, exceeds the quantity supplied, Qs. There is excess demand, also called a shortage. In the financial market, what causes a movement along the demand curve? What causes a shift in the demand curve? 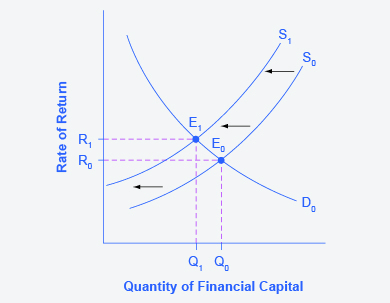 In the financial market, what causes a movement along the supply curve? What causes a shift in the supply curve? If a usury law limits interest rates to no more than 35%, what would the likely impact be on the amount of loans made and interest rates paid? How is equilibrium defined in financial markets? What would be a sign of a shortage in financial markets? Would usury laws help or hinder resolution of a shortage in financial markets? Suppose the U.S. economy began to grow more rapidly than other countries in the world. What would be the likely impact on U.S. financial markets as part of the global economy? If the government imposed a federal interest rate ceiling of 20% on all loans, who would gain and who would lose? Table 6 shows the amount of savings and borrowing in a market for loans to purchase homes, measured in millions of dollars, at various interest rates. What is the equilibrium interest rate and quantity in the capital financial market? How can you tell? Now, imagine that because of a shift in the perceptions of foreign investors, the supply curve shifts so that there will be $10 million less supplied at every interest rate. Calculate the new equilibrium interest rate and quantity, and explain why the direction of the interest rate shift makes intuitive sense. Changes in the interest rate (i.e., the price of financial capital) cause a movement along the demand curve. A change in anything else (non-price variable) that affects demand for financial capital (e.g., changes in confidence about the future, changes in needs for borrowing) would shift the demand curve. 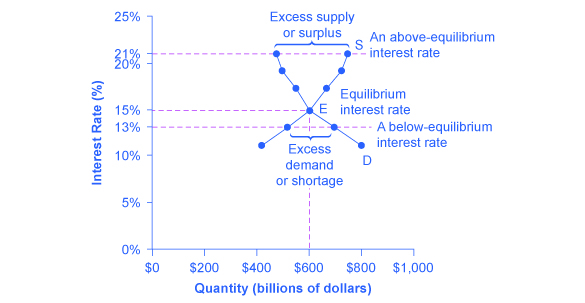 Changes in the interest rate (i.e., the price of financial capital) cause a movement along the supply curve. 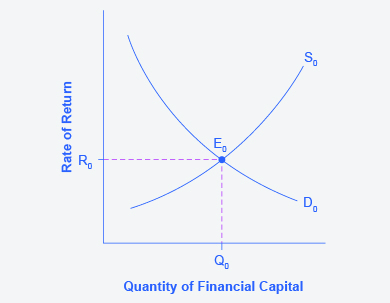 A change in anything else that affects the supply of financial capital (a non-price variable) such as income or future needs would shift the supply curve. If market interest rates stay in their normal range, an interest rate limit of 35% would not be binding. If the equilibrium interest rate rose above 35%, the interest rate would be capped at that rate, and the quantity of loans would be lower than the equilibrium quantity, causing a shortage of loans. b and c will lead to a fall in interest rates. At a lower demand, lenders will not be able to charge as much, and with more available lenders, competition for borrowers will drive rates down. a and c will increase the quantity of loans. More people who want to borrow will result in more loans being given, as will more people who want to lend. 4.2 Demand and Supply in Financial Markets by Rice University is licensed under a Creative Commons Attribution 4.0 International License, except where otherwise noted.